You asked for it, and Pierogi Jo's has answered the call! Join us Friday, May 3rd at 5pm for another Pierogi Night here at Plank Road Tap Room. Grab some tasty flavor pillows, a beer, and hang out on the porch, patio, or in the beer garden. NOTE: We're a 21-and-over venue, so you'll need to leave the kiddos behind. All dates, times and tappings subject to change. We’re just going to leave this here and fill in the details later, man. - We’ll be tapping Lagunitas Waldo’s Special Ale around 5pm, as well as some other TBD ‘Nitas beers. - Perk N’Pickle Food Truck will be grilling up dinner in the backyard. - You won’t want to miss this party if the last two years are any indication. NOTE: 21-and-over only, no kiddos. 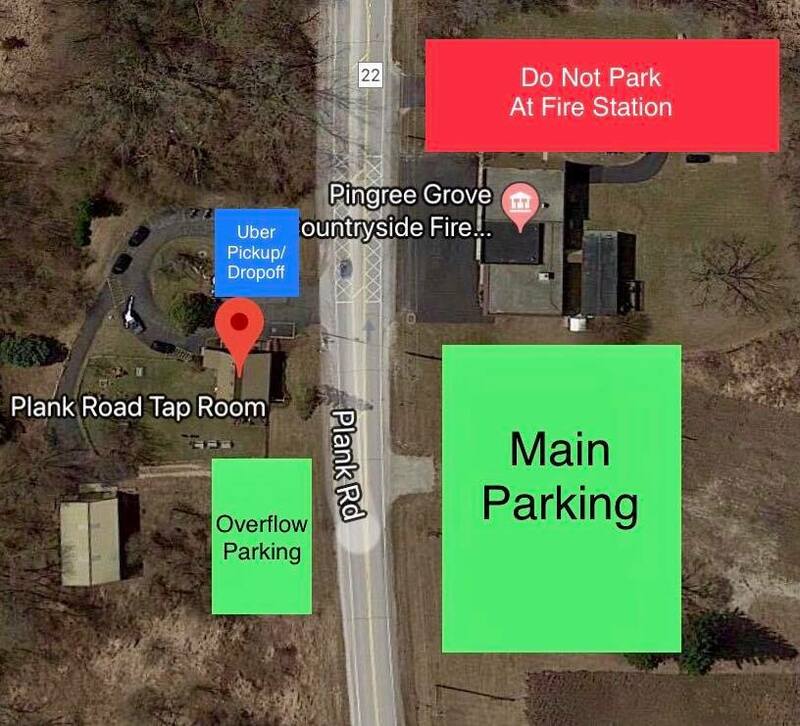 Parking may be limited and is for tap room party goers only. People have always told us we're a little nuts for opening a tap room in the #MiddleOfEverywhere. Now, we're ready to prove them right. Join us on Friday, November 9th, as we tap the new collaboration between our friends at Noon Whistle Brewing and Mr. Peanut himself.....Mr. IPA-Nut. Photo ops? Oh, we got em. The Nutmobile will be parked at the cabin and ready to explore and explode minds and Instagram feeds. We'll have the keg of Mr. IPA-Nut tapped at 5pm and pouring until it's gone, plus a few cans to-go while they last. Bopbartruck will be out to fill your stomachs with tasty Korean BBQ dishes from around 5pm until they call it quits. NOTE: 21-and-over, absolutely no one under 21 allowed, despite the Nutmobile appearance. Dates, times, and tappings subject to change. Join us Saturday, Nov 3, from 3pm - 7pm as we welcome Pierogi Jo’s back to the tap room. Try their new specialties for November - Sweet Potato and Blue Cheese Pierogi and Korean Pork Pierogi with Kimchi Slaw. NOTE: 21-and-over only. All dates and times subject to change. On Friday, October 26th, things are getting dark and doomy around the tap room. 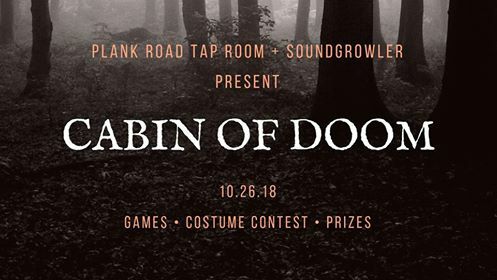 Join us for our annual Halloween party with our co-hosts Soundgrowler Brewing Co. and Chuck's Wood-Fired Pizza. Costume contests, games, prizes, and spookiness galore will be in abundance. We'll be tapping some awesome Soundgrowler beers, including a one-off cask, and Chuck will be out back baking up some wood-fired pizzas. The tunes will be dark and heavy, much like our hearts. Let's get weird. NOTE: We're a 21-and-over venue, so you'll need to leave the kiddos behind. All dates, times, and tappings are subject to change. Help us welcome Milwaukee’s City Lights Brewing Company as we tap three of their beers and welcome their representative Quinn to the tap room. Food-wise, we’ll have the return of Bop Bar and their delicious Korean BBQ dishes. The fun starts around 5pm. See you then! NOTE: 21-and-over. Dates, times, and tappings subject to change. The Pints for Pints Blood Drive! Saving lives takes courage. We're proud to present a fun and easy way to take the first step. Join us on Tuesday, Sept 25 from 2:00 PM - 7:00 PM here at Plank Road Tap Room. For each pint of blood donated, receive a coupon for one beer (restrictions apply), redeemable that day or at a future date if you are unable to imbibe after your donation. Perk N' Pickle will be here serving up tasty bites to help you feel better post-donation! - Donor must be in good health and feeling well. - Must weigh 110 pounds or more. - It is recommended to eat something within the four hours prior to the donation. - Fever, persistent cough, sore throat or chest congestion disqualifies a donor. - Must be eight (8) weeks between regular whole blood donations. Waiting period must be sixteen (16) weeks after double red cell apheresis: seven (7) days after platelet apheresis. - Donors taking medications may be deferred from donating due to their underlying medical condition. Check with the Heartland staff for acceptability. - Travel to certain parts of the world may be cause for deferral. Check with the Heartland staff to determine eligibility. NOTE: We are a 21-and-over venue. Donators under 21 may donate blood but cannot enter the tap room or beer garden. Food. Beer. Art. Thursday, Sept 20, has it all. Join us for our first coaster art Drink and Draw night. All artists of all levels and styles are invited. We'll supply the blank coasters. Bring your favorite utensils, we'll have a few sharpies and standard pens available as well. How it works: we'll have each artist throw different subjects into a hat. We'll draw a new topic every thirty minutes or so. Once complete, we'll take photos of everyone's drawings and post them online. Perk N Pickle will be here serving up their awesome cuisine, so show up hungry and fuel that creativity. Peanut butter and jelly. Mac and cheese. Chubby and Checkers. Some things just go together. Half Acre Beer Company and TRVE Brewing have come together to create a wyld ale of epic proportions. Path of Nomad was fermented with both breweries' combined house cultures atop blackberry puree in neutral oak, aromas of fresh lavender and sage streaked by vine ripened watermelon and lime. Additionally, we'll have Deep Space Double IPA and Tuna Extra Pale Ale on draft inside while Perk N Pickle will be out back with their amazingly tasty menu. There are always plenty of games to choose from, and the group loves to teach newcomers how to play. Feel free to bring some of your favorites from home, some friends and start your own table. Grab dinner from our friends Perk N Pickle who will be out back cooking up some delicious dishes! NOTE: We are a 21-and-over venue. We're switching things up and bringing you the bites on Wednesday, Sept 5. Why? Well, scheduling conflicts...and to feed our monthly board game night participants, The Dice and Pints Society! The public is invited to join in on all the fun. Grab some food, some friends, a seat at one of the game tables, and have some fun. NOTE: we're a 21-and-over venue. Menu, dates, and times subject to change. Our buds at BrickStone Brewery have a new Citra IPA for you to try, and we're hosting a little soirée to get a pint into your hands! Permanent Vacation is a Citra IPA with tasty, fruity notes of pineapple and grapefruit. At 6% ABV, it's a perfect beer for sipping on our porch, patio, or in the beer garden. Katie from Brickstone will be out to hang and talk about the brewery, so make sure you say hi. We'll also have tasty eats from La Comodita Food Truck! They'll be serving up tasty balls of Sicilian goodness from 5pm to whenever. NOTE: We're a 21-and-over venue, so you'll need to leave the kiddos behind. All dates, times, and tap lists subject to change. It's late summer and weekends are seeming shorter and shorter. So, let's get a head start on the fun with a new season of Thursday Night Bites! First up, this week we have Perk N Pickle heading over to cook up some of their killer grub. We'll post the menu as soon as we know what they're planning for us. We'll likely tap a little something fun, as well, so keep an eye out for more announcements. NOTE: We're a 21-and-over venue, so you'll need to leave the kiddos behind. No outside beverages or coolers allowed. Parking may be limited and is for tap room guests only. All dates and times subject to change. Relax...you have reached the Elgin City Limits. Four years ago, we opened Plank Road Tap Room in a little cabin right on the edge of town...somewhere between nowhere and everywhere. On Saturday, August 18, help us celebrate the only way we know how...surrounded by great beer and even better friends. Choose when you want to party with us: afternoon or evening. And choose how you want to party with us: a la carte, with beers included, or sporting a limited edition shirt. We'll have some tasty partners (including Chuck's Wood Fired Pizza all day) and fun events throughout each session. Each ticket purchased prior to the event will receive a limited edition Elgin City Limits beer glass. CASK TAPPING: BuckleDown Belt & Suspenders w/ Mulberries handpicked from Plank Road Tap Room's mulberry trees! NOTE: Adults over 21 only. No doggos at this event please. Tappings subject to change and available while they last. Event is rain or shine. No ticket refunds. General admission tickets are available at the door and DO NOT include a commemorative glass. Service fee will apply. Join us Saturday, Aug 11, at 5pm for another Pierogi Night here at Plank Road Tap Room. Grab some tasty flavor pillows, a beer, and hang out on the porch, patio, or in the beer garden. If puff sandwiches and pizza nuggets sound like a thing you would enjoy while sipping on a beer-y beverage, you'll want to come out on Saturday, August 4th. Puff Truck - Pizza Puff Food Truck will be out back starting around 5pm and can't nobody hold them down. They'll wrap up when it slows down or they sell out of food, whichever comes first, so don't roll in too late if you're planning on eating their tastiness. We aim to tap some pretty gnarly, super secret beers that day as well, so you may want to keep an eye out for more announcements about this date. Only a few summer Saturday evenings left, so we should all make the most of them while we can! Dig out your boat shoes and ascots. Thursday, August 2, is #NationalIPAday, and to celebrate we're joining forces with our friends at Ballast Point Brewing Company to throw one of our favorite events of the year: Yacht Rock Party! Join us around 5pm for an evening of killer IPAs, rad food from Mario's Cart (tacos and so much more), and smooth grooves from the late 70s and early 80s emanating from the tap room sound system. - PLUS: the return of Big Eye on the Heritage Handle! Liz from Ballast Point will be here with games and giveaways. Jeremy and Alan will be on deck behind on the bar all night serving up the goods, so you know good times and disaster are bound to happen. NOTE: 21-and-over only. Leave the kiddos at home. Parking may be limited and is for tap room guests only. Dates, times, and tappings are subject to change. Pizza and beer. Beer and pizza. We don't know about you, but nothing goes better together on a Friday night. Chuck will keep the pizzas coming until they're gone (or until he's done). We'll see you then. NOTE: We're a 21-and-over venue, so you'll need to leave the kiddos behind. No outside beverages or coolers allowed. Parking may be limited and is for tap room guests only. All dates, times, and tap list subject to change. 1) We're tapping New Holland Brewing Co. Dragon's Milk Cherry Chocolate Bourbon Barrel Stout. Let that sink in. 2) Cheesie's Truck will be here grilling up sandwiches left and right. We'll have some other tappings as the date gets closer, but we'd block off this day for sure if we were you. With all these double IPAs being tapped for our Hop Butcher Double IPA Showcase this Saturday, we figured some food to fill your bellies would be a good idea. Luckily, Chuck's Wood Fired Pizza was able to put together a squad and answer the call. Grab some 'za starting at 5pm while they last! June's coming to a close, and we're saying farewell with a patio party featuring our friends at Spiteful Brewing and Cheesie's Truck. Meanwhile, Cheesie's will be cooking up their mindblowing grilled cheese sandwiches and sides. Get in early; when the cask and sammies are gone, they're gone. Sometimes we need to put our beer tracking apps down, let our palates rest, and drink some good ol' fashioned beers that sustained an industry before "craft" was even conceived. Join us Friday, June 22, at our Elgin area taproom for Heritage Beer Night. We'll be slinging cans of some classic beers, from PBR to Old Style to Schlitz and more. Grab your friends and family who don't like "fancy beer" and show them that we can all have a good time together over a cold one. Meanwhile, Chuck's Wood-Fired Pizza will be out back cranking out their amazing 'za. Come and get it while it lasts. Brunch is back, and this time we're bringing some new faces (and food) to our Elgin area taproom! Looks like we skipped spring and ran face-first into summer, which means it's time to party down with Pollyanna Brewing Company & Pierogi Jo's! Join us Friday, June 8th as we celebrate summer's arrival with one of the most crushable local summer beers, Summerly Raspberry Wheat Ale. We'll also have some other Pollyanna beers on tap. On the food front, Pierogi Jo's will be making their Plank Road debut with some fanastic pockets of flavor. Grab a few and a brew, and get out to the patio and beer garden asap. Service starts around 5pm and ends when you run them out of food. Time to dig out those Hawaiian shirts and coconut bikinis. It's time for Lü-Wow: Year Two-Wow! Join us in the backyard (weather pending...stupid weather) for an evening of food and fun. Our friends at Solemn Oath Brewery will help us sling $4 cans of Lü Kolsch-style ale, as well as one of our summer favorites, LüTonic, on tap. We'll also be handing out raffle tickets from 4-6pm to anyone with a Hawaiian shirt on. At 6pm, we'll draw a winner of two tickets to Solemn Oath's upcoming party, Oath Day on June 9th (or a brewery tour if you can't make it). We're talking plates of up to one pound of pork! Or less if that's your thing. No tickets necessary, just show up hungry and pay per plate! Party starts around 4pm and goes until it's over.